In a Robot Coupe, puree chicken, egg, heavy cream, cumin, coriander, chili powder, paprika until semi-smooth; add 1/2 cup of beer and pulse just enough to incorporate beer evenly. With rubber spatula, scrape chicken mousse into large mixing bowl. Fold in fennel seed, artichokes, tomatoes, onions, garlic; season generously with salt and fresh cracked black pepper; continue to fold with spatula until all ingredients are evenly distributed, be careful not to smash tomatoes and artichokes. Transfer mixture into sausage maker and pipe into hog casings, tying off links in 6” increments. With a pin or skewer puncture casings very lightly over any air bubbles contained within the sausages. Bring remaining beer and chicken stock to a simmer; poach sausages at about 180 degrees for about 5 minutes. Remove and reserve sausages. In medium sauce pot, heat oil over medium heat, add garlic and cook until translucent. Add artichokes, thyme, and wine; season generously with salt. Cover, reduce heat to very low simmer, cook for about 20 minutes; until artichokes are tender and cooked through. Preheat oven to 200 degrees. Place tomatoes, open side up, on baking pan lined with foil. Place a few slices of garlic and one sprig of thyme on each tomato half; very generously drizzle oil over tomatoes. Season with salt and pepper; cook for about 2 1/2 hours. Whisk mustard and beer together. Heat remaining artichokes and confit tomatoes, toss in a bowl with Frisee and arugula (to make a salad). 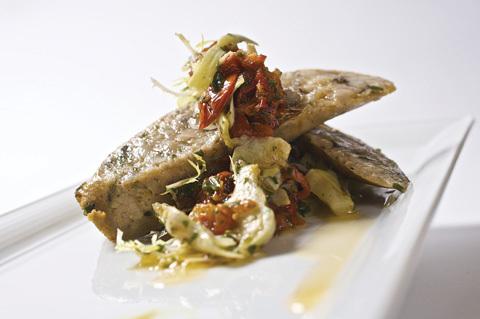 Cut sausage on a bias, put on plate on top of a small dollop of mustard, garnish with artichoke and tomato salad.